To draw a good diagram of a business workflow you should have a ready-to-use set of pre-designed objects you may drag-and-drop to your document focusing on the workflow structure and meaning, not drawing tools. ConceptDraw DIAGRAM with Workflow Diagrams solution provides complete set of design element you may use to draw a good diagram of a business workflow. ConceptDraw DIAGRAM with the Workflow Diagrams solution are set of the professional drawing software for diagram workflows. Use this set for drawing Workflow diagrams by drag-and-drop library objects to page and connect them with arrows or use the template to simple start. 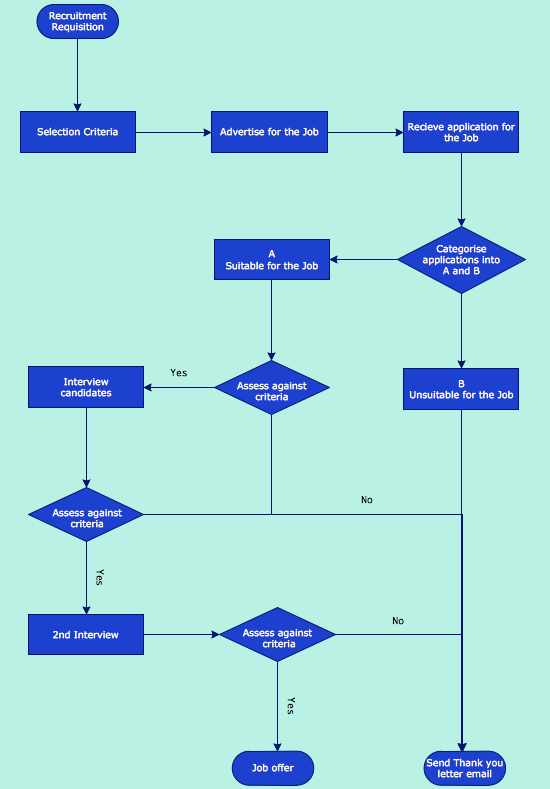 Pic.1 Workflow chart sample: Recruitment. This example shows a workflow chart that clearly illustrates stages of recruitment work flow. ConceptDraw RapidDraw technology is a simple point-and-click design that helps create professional, presentation-ready business process diagrams quickly and efficiently.